One of our favorite looks is a blazer with jeans. There's no easier way to look polished and professional, chic and sophisticated, even in denim! And ponte is a great choice for comfort, too. 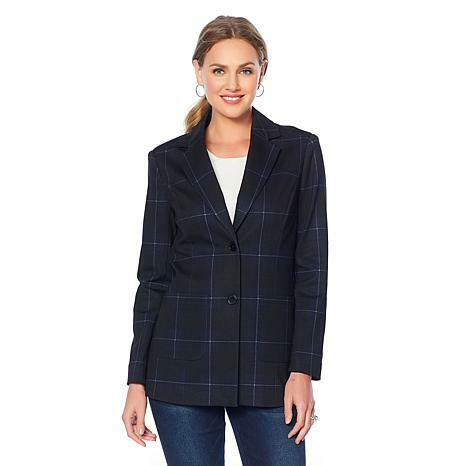 Paired with a skirt, a sheath dress or tailored pants, this luxurious jacket completes a high-class ensemble you can wear anywhere. These blazers are very warm, & for me that is a plus. I like layering & these make it possible. The pockets are perfect for hiding your phone or whatever you need to keep confidential. The fit is perfect. They look so polished & professional. I fit my regular XL size. The sleeves are a great length too. No issues with washing & hanging to dry. Get the matching pants if you can, look so tailored as a set. Please make these a regular in this product line for all year wearing. Love them! This blazer is very nice. It's better than I expected. The color is a deep blue which I love and the cut is nice. The fabric is better than I anticipated for a ponte. It is made well. I think I may get 2 more. Love everything about this jacket! IT just really fits and Looks Great !! THANKS Diane ! I purchased this to go with the pants I have in this pattern item 624029. This jacket like the pants are very well made and a heavy material. The quality of this is excellent. I am a normal size medium and that is what I ordered being 5'2 140/lbs. 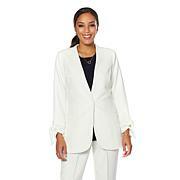 My normal shirt size is a medium this blazer fits just right to layer an button up if need be. I highly recommend this jacket. It goes good with jeans also. We are totally crushing on velvet this season! Add this luxe velvet blazer to your cold-weather wardrobe rotation for glamorous, up-to-date style.